Another of Godzilla’s species is discovered on an island, along with a spiky creature called Angilusaurus (or Angilus for short). Before long the two monsters are wrecking havoc. 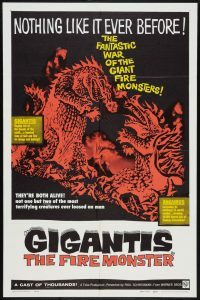 Though this film was rushed out, it has the advantages of being made in the age when Godzilla films were serious-themed. The scenes in which city populations are told to turn their lights off to avoid Godzilla’s attention at night are atmospheric and recall World War 2, when city lights were turned off to avoid the attention of enemy bombers. The music is haunting and the scenery, especially on the island, is suitably eerie. The film does tail away towards the end, but it’s still one of the stronger sequels. As with the original, and most other Godzilla films, the original non-dubbed version with subtitles is recommended.